One of the guiding decisions behind your roof material will be how steep the slope of your roof is. 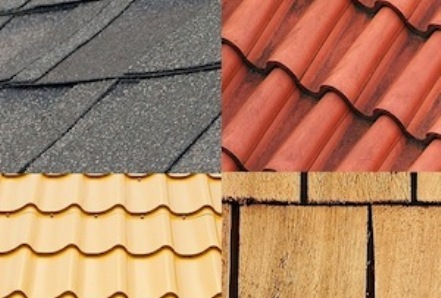 Most people turn to asphalt shingles because they’re affordable, and they also come in plenty of different colors. They’re incredibly durable for the amount that you pay, so it’s easy to get something that’s going to work well for your home. You can get shingles that have been treated with algaecide. You have shingles that are made to different thicknesses, for a look that will definitely get attention. Most people buy self-sealing asphalt shingles because the heat of the day makes each one stick to the shingle below it. This can help block the wind’s natural ability to peel the shingles up and then off the roof. If you have a flat roof, you might want to think about a “built-up” roof. You basically will take a multi-ply approach to the roof’s construction, pairing felt or fiberglass with lots of binder and a coating. Insulation is placed under this setup to help with energy conservation. It’s an incredibly strong system that’s employed in a wide variety of buildings. Do you like the idea of wood, but you want something a bit more modern? You have to check out fiber-cement roofing products. You get the durability and structure of cement, with fiber woven in. It’s very fire-resistant, something that many homeowners are concerned with. The final choice here that we wanted to mention would be a metal roof. If you have a really steep slope, you can go with metal roof panels. In addition, you can count on them being very lightweight. There are plenty of other roofing materials to choose from, but these are the three materials that you’ll see pop up all of the time. It depends on your specific goals for the roof, but you could really choose any of the three mentioned in this guide. Check it out!